Something big happened in Ipswich yesterday. On the 2nd of November, Bishopp launched the city’s first digital billboard at the gateway to the CBD. Bishopp’s newest digital asset also delivers on a partnership with Ipswich City Council that will see a landmark public art addition to East Street and provide community messaging for news and events. 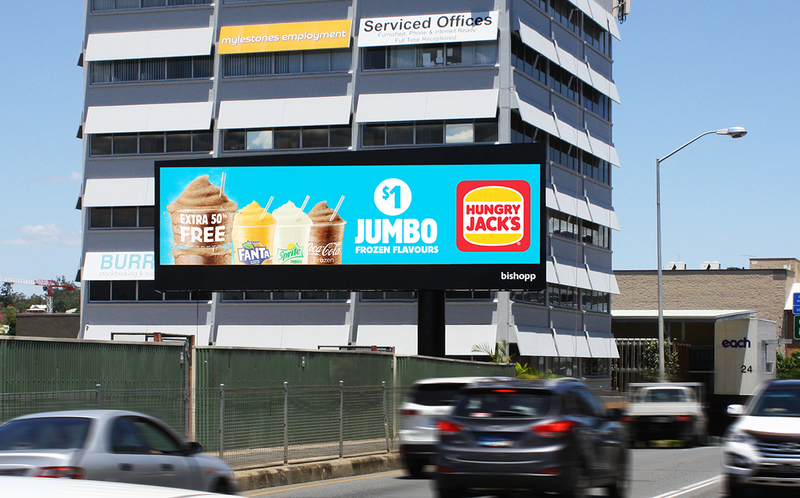 You can view the state of the art LED billboard at the Ipswich Corporate Centre on East Street. We were joined by local news ‘The Queensland Times’ to cover the unveiling of the digital billboard. The billboard itself contains three lighting sensors so it will automatically adjust to the conditions and the time of day, turning into “sleep mode” from 11pm to 5am. With estimates of around 33,000 vehicles a day crossing the David Trumpy Bridge, it is believed to be the busiest road in Ipswich. If you estimate 1.5 people per vehicle, that’s around 50,000 people who cross the bridge between North Ipswich and the CBD*. As part of Bishopp’s partnership with Ipswich City Council, we will also be delivering a new public art mural to compliment the digital addition to the Ipswich CBD. The public mural, to be painted by Brisbane-based artist, Adam Busby will be showcased along the entire length of the rail overpass and will “give back” to the local community and help promote active transport in Ipswich.